We’d love your help. Let us know what’s wrong with this preview of Science Comics by Jason Viola. Do you have what it takes to live in one of the harshest places in the world? What if you had just a couple years to gain the knowledge you'll need to survive on your own? Join two curious polar bear cubs as they play, hunt, and navigate life in the Arctic. With each season, they learn polar bear biology and behavior, as well as strategies and skills that will help them th Do you have what it takes to live in one of the harshest places in the world? What if you had just a couple years to gain the knowledge you'll need to survive on your own? Join two curious polar bear cubs as they play, hunt, and navigate life in the Arctic. With each season, they learn polar bear biology and behavior, as well as strategies and skills that will help them thrive in a landscape that is rapidly changing beyond their control. Living with super insulated bodies in a world that's melting? For polar bears, keeping cool is the name of the game! To ask other readers questions about Science Comics, please sign up. This was really cute! Learned some stuff about polar bears I didn't know. I kind of feel sad now after reading this comic book. I don't want polar bears to become excited because of melting ice caps. I really like the Science Comic Series. They cover many subject matters, but this one is about Polar Bears as well as what it takes to survive in the high north. It shares information about the formation of ice, the melting of the polar ice caps and global warming as well as what we can do to stop it. We learn about a polar bear family, how they live, what they eat, how they hunt and more. Buckle up as you read this adventure about Anik, Isla and their mother. 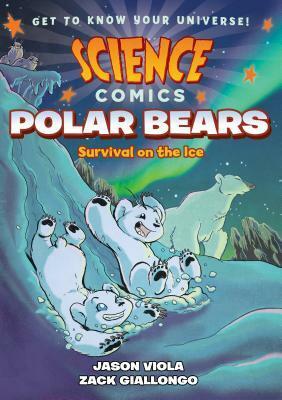 Join two curious polar bear cubs as I really like the Science Comic Series. They cover many subject matters, but this one is about Polar Bears as well as what it takes to survive in the high north. It shares information about the formation of ice, the melting of the polar ice caps and global warming as well as what we can do to stop it. We learn about a polar bear family, how they live, what they eat, how they hunt and more. Buckle up as you read this adventure about Anik, Isla and their mother. Do you have what it takes to live in one of the harshest places in the world? What if you had just a couple years to gain the knowledge you'll need to survive on your own? Join two curious polar bear cubs as they play, hunt, and navigate life in the Arctic. With each season, they learn polar bear biology and behaviour, as well as strategies and skills that will help them I received a DIGITAL Advance Reader Copy of this book from #NetGalley in exchange for an honest review. Do you have what it takes to live in one of the harshest places in the world? What if you had just a couple years to gain the knowledge you'll need to survive on your own? Join two curious polar bear cubs as they play, hunt, and navigate life in the Arctic. With each season, they learn polar bear biology and behaviour, as well as strategies and skills that will help them thrive in a landscape that is rapidly changing beyond their control. Living with super insulated bodies in a world that's melting? For polar bears, keeping cool is the name of the game! Get ready to explore the depths of the ocean, the farthest reaches of space, and everything in between! These gorgeously illustrated graphic novels offer wildly entertaining views of their subjects. Whether you're a fourth grader doing a natural science unit at school or a thirty-year-old with a secret passion for airplanes, Science Comics is for you!. Viola, Jason. Science Comics: Polar Bears: Survival on the Ice. First Second, 2018. Science Comics is back again with another riveting adventure filled with facts about the life of polar bears. Follow two polar bear pups as they grow up, and learn about these fascinating creatures: their habitat, their habits, what they eat, and how we can protect them. Colorful illustrations and facts and details are great for readers who prefer nonfiction titles, and the graphic novel format makes this book acc Viola, Jason. Science Comics: Polar Bears: Survival on the Ice. First Second, 2018. Science Comics is back again with another riveting adventure filled with facts about the life of polar bears. Follow two polar bear pups as they grow up, and learn about these fascinating creatures: their habitat, their habits, what they eat, and how we can protect them. Colorful illustrations and facts and details are great for readers who prefer nonfiction titles, and the graphic novel format makes this book accessible for a wide range of reading levels. I was trying to take this slow so I could savor it and completely failed! This is a graphic novel written from the perspective of a mama polar bear teaching her two cubs how to be polar bears. The result is a hugely entertaining, witty, adorable, and educational work of art. Not just for kids - I learned a lot! Wonderful way to teach people about polar bears. I have read lots of books on polar bears but really enjoyed the humor in the comic used to explain the life of a polar bear as human science understands it and all without making the bears appear human in personality. I suggest people all ages read to learn and be entertained! The perfect combination of words and pictures that communicate facts, funny, and heart. Another great entry in this series of STEM graphic novels! Zack Giallongo's lovable polar bears are full of movement and action in total harmony with the very readable and many times humorous prose of Jason Viola. First Second would be smart in teaming these two up again. One of the top books in the series. Fun to read storyline is excellently paired up with facts. Another fact filled installment in the Science Comics series. Not only will readers learn about polar bears but also about ice and seals. Probably included one of the goriest scenes in the series. This comic book is amazing. As a former science teacher the content that this covers is fantastic and so on point for inquiring minds. As a librarian the format, the graphics and the content all work together perfectly. This series is popular at my library!